This time of year, Kohlrabi is available at our local farmer’s markets and sometimes at the local grocery stores. 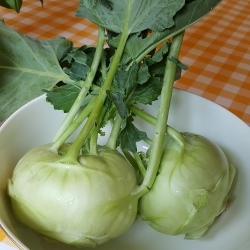 People ask me all the time, “What is this vegetable and what do you do with it?” The easiest answer is: It is a vegetable similar to cabbage, but tastes like an apple and a turnip had a baby! It has coarse, funky skins that should be peeled off prior to eating. Since they are so thick, I use a knife to slice off the exterior. You can eat the greens, but I often have a hard time finding them still attached and in good shape; they are similar to collard greens and some types of kale. Some people like to eat kohlrabi raw like an apple. I know lots of people enjoy using kohlrabi in slaws and salads. Other people like to cook them in ways similar to broccoli. What is my preference? I make it into a noodle 99% of the time! Kohlrabi is firm enough to keep its shape in a stir fry, saute, or soup, but when cooked it feels very much like a pasta. 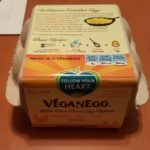 It is very nutritious because it is high in potassium and vitamin C. Besides it is easy to prepare and is a great replacement for those on gluten free or low carb diets. 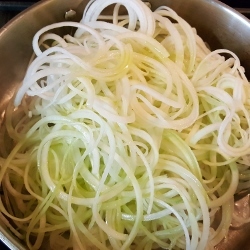 Kohlrabi mixes well with other vegetables, sauces, and proteins. 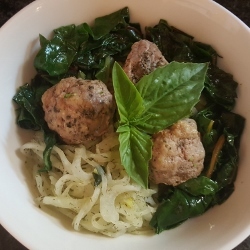 In this post, I have included my basic recipe for Kohlrabi noodles and included a photo of how I served it most recently — with rainbow chard and some turkey meatballs. I also really like to serve it with carrot marinara too.